Adding a brightly colored stain to your outdoor wood furniture is an easy way to quickly brighten up your patio and garden. Outdoor furniture can become dull and weathered over time from continuous exposure to the elements. You can revive your chipped or peeling patio tables and chairs and give them a fresh new look with a bright coat of paint. All you need is wood stain, paint brushes and a few hours to spend outdoors. Prepare your work area by laying newspaper under the furniture if you're working on grass. If you're working on concrete, wet the surface with a hose to dilute the stain mixture, allowing it to be quickly washed away. Spray your outdoor wood furniture with a hose to clean it thoroughly. 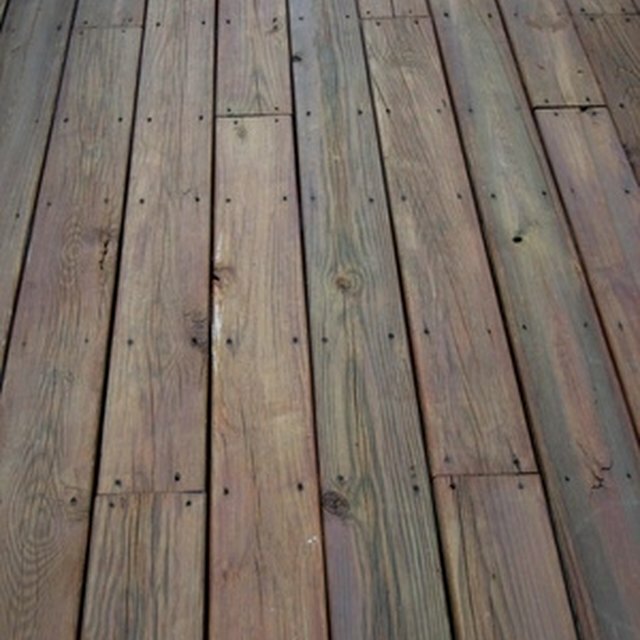 Apply a deck cleaning solution, or brightening solution, to remove accumulated dirt and replenish the wood. Note: Work your way upward with the solution to avoid streaks. Allow the solution to soak into the furniture for several minutes. Scrub away any remaining paint or engrained dirt with a wire brush. Rinse off the remaining solution, and allow the furniture to dry completely in the sun. Sand the furniture with grit sandpaper for a smooth, even surface. Note: Do not over-sand or the wood will have difficulty absorbing the paint. Use a folded over piece of sandpaper to sand the tight spaces and edges. Coat the furniture with a wood primer, using a broad brush paintbrush. Coat the furniture with a gel wood stain. Use a paintbrush to coat the edges, and use the applicator pad, which comes with the stain, to coat the flat pieces of the wood. Spread evenly, and work the stain into the grain of the wood. Allow the stain to dry completely. Your wood furniture will be protected for years to come. Before you begin, it's helpful to know the type of wood you're working with. A blotchy wood with an uneven grain will absorb the stain unevenly. This may have a desirably rustic appeal, but if not, applying a wood conditioner before you stain will help create a more even surface. Wood with an even, consistent grain is easier to stain evenly but may require a few more coats.